Ht / Wt: 6'3" / 216 lb. 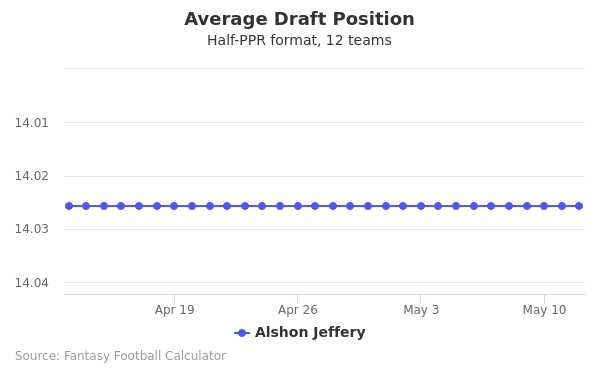 Alshon Jeffery's fantasy value is measured by his average draft position (ADP) in fantasy football mock drafts. 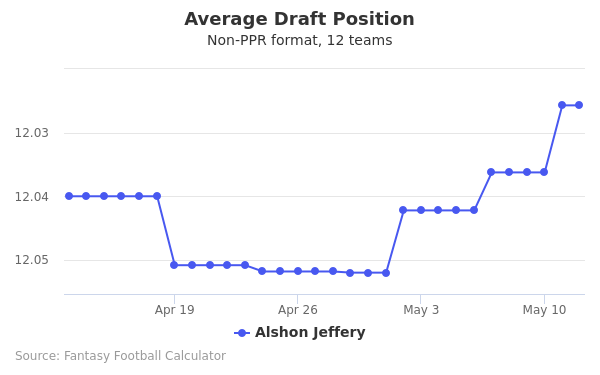 In recent drafts, Jeffery's current ADP is 5.07, which indicates that his fantasy outlook is to be the 7th pick of the 5th round, and 54th selection overall. 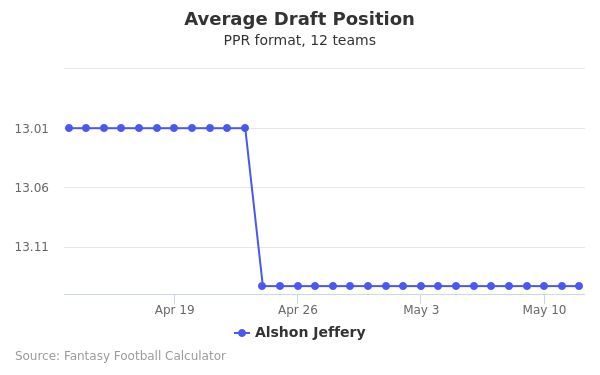 The code below will display a graph that updates every day to show the ADP data for Alshon Jeffery for the past 30 days in 12-team PPR leagues. Draft Alshon Jeffery or O.J. Howard? Draft Alshon Jeffery or Tevin Coleman? Draft Alshon Jeffery or Tyler Boyd? Draft Alshon Jeffery or Kenyan Drake? Draft Alshon Jeffery or Deshaun Watson? Draft Alshon Jeffery or Will Fuller? Draft Alshon Jeffery or Chris Godwin? Draft Alshon Jeffery or Evan Engram? Draft Alshon Jeffery or Calvin Ridley? Draft Alshon Jeffery or James White? Draft Alshon Jeffery or Mike Williams? Draft Alshon Jeffery or Hunter Henry? Draft Alshon Jeffery or Lamar Miller? Draft Alshon Jeffery or Jordan Howard? Draft Alshon Jeffery or Doug Baldwin? Draft Alshon Jeffery or Russell Wilson? 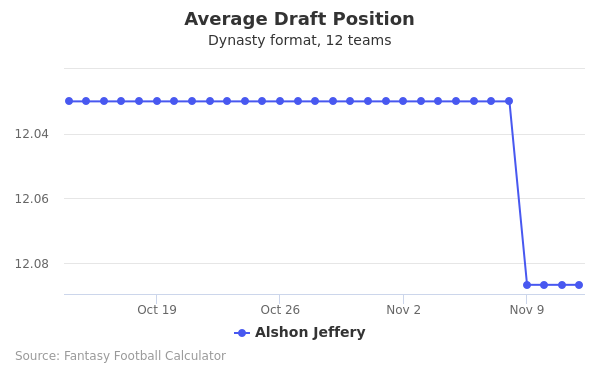 Draft Alshon Jeffery or LeSean McCoy? Draft Alshon Jeffery or Tyler Lockett? Draft Alshon Jeffery or Drew Brees? Draft Alshon Jeffery or David Njoku? Draft Alshon Jeffery or D.J. Moore? Draft Alshon Jeffery or Sammy Watkins? Draft Alshon Jeffery or Rashaad Penny? Draft Alshon Jeffery or Robby Anderson? Draft Alshon Jeffery or Kareem Hunt? Start Alshon Jeffery or O.J. Howard? Start Alshon Jeffery or Tevin Coleman? Start Alshon Jeffery or Tyler Boyd? Start Alshon Jeffery or Kenyan Drake? Start Alshon Jeffery or Deshaun Watson? Start Alshon Jeffery or Will Fuller? Start Alshon Jeffery or Chris Godwin? Start Alshon Jeffery or Evan Engram? Start Alshon Jeffery or Calvin Ridley? Start Alshon Jeffery or James White? Start Alshon Jeffery or Mike Williams? Start Alshon Jeffery or Hunter Henry? Start Alshon Jeffery or Lamar Miller? Start Alshon Jeffery or Jordan Howard? Start Alshon Jeffery or Doug Baldwin? Start Alshon Jeffery or Russell Wilson? Start Alshon Jeffery or LeSean McCoy? Start Alshon Jeffery or Tyler Lockett? Start Alshon Jeffery or Drew Brees? Start Alshon Jeffery or David Njoku? Start Alshon Jeffery or D.J. Moore? Start Alshon Jeffery or Sammy Watkins? Start Alshon Jeffery or Rashaad Penny? Start Alshon Jeffery or Robby Anderson? Start Alshon Jeffery or Kareem Hunt? Alshon Jeffery was born on 2/14/1990 in St. Matthews, South Carolina. He went to Calhoun County High School in St. Matthews, South Carolina and was one of, if not the best, receiver and athlete in the state by his senior year. At 6'3'' and 218 lbs, he's a versatile speedster with length. He was aggressively recruited by schools throughout the country. Jeffery was the 12th best receiver in the country out of high school. He was a four-star receiver and the 6th best athlete in South Carolina. He went to the University of South Carolina, where he quickly made a name for himself. He provided highlights every week and cemented himself as one of the best athletes in college football. In 2009, his freshman year, he caught 46 passes. The next year, he increased this number to 88 catches, which was the best in the SEC. He also had the most receiving yards in the country with 1517 yards. His next year wasn't as productive, but he still had 49 receptions. He finished his college career with 3042 receiving yards, which was 4th in SEC history. In 2010, he was an All-American and First-Team All-SEC selection. In 2011, he made the second-team All-SEC team. Alshon Jeffery was drafted by the Chicago Bears and was the 13th pick in the second round, 45th overall. While he didn't participate at the combine, he did run at his school's pro day. He was clocked with a 40 time of 4.38 seconds. His vertical and other drill stats weren't recorded. While this may have set him back slightly, scouts had more than enough tape to go off of. In his rookie year, 2012, he played 10 games and had 24 receptions for 367 yards and 3 touchdowns. In 2013 and 2014, Jeffery played all 16 games. He caught 89 and 85 passes, respectively and went for over 1,000 yards receiving both years. In 2013, he was selected to the Pro-Bowl for the first time. In 2015, Jeffery played 9 games due to injury. He fought to get back on the field and although his season was short, he still managed to catch 54 passes for 807 yards and 4 touchdowns. In 2016, Jeffery signed a one-year contract with a salary of nearly $15 million. By 2016, Jeffery was a star wide receiver and was widely popular in the league and on fantasy football teams across the country. He played 12 games, had 52 receptions, and 821 yards. He also recorded 2 touchdowns. As in previous years, he provided plenty of highlights for his fans. Like his team, Jeffery and the Bears struggled to keep pace with the rest of the league. In 2016, the Bears went 3-13 and finished last in their division, the NFC North. They were 7 games behind the division Champion, the Green Bay Packers. Jeffery and the Bears will look to improve next season. As in previous years, Jeffery will be key if the Bears want to climb up the ranks in the NFC North. Throughout his college and NFL career, Jeffery struggled with hamstring, leg, and other injuries. While a standout in the NFL, he's a sketchy pick for fantasy football because he's so injury prone. He has a lot of upside, but he's a risk, and isn't as constant as some other receivers who don't get injured as often. Alshon Jeffery isn't as outspoken as other receivers in the league, but he's still social inside and out of the locker room. He's active on twitter and his handle is @TheWorldof_AJ. While he has plenty of fan pages on instagram, he doesn't have his own account. Alshon Jeffery's jersey can be purchased at nflshop.com. He has also signed memorabilia, which can be found and authenticated online. While he's been rumored as having a girlfriend in the past, it's not clear if he's dating at this time.